If you are a juvenile court judge, a court administrator, a judicial clerk, or other court staff member, you’ll find useful info here. How can we apply CPRS in our court? Judges – Monitor cases and the latest case plan information, including CASA and Panel reports. Access court orders at your fingertips. Login from the bench during hearings and open cases in real time; project the case plans and discuss these with relevant parties. Clerks– Make court orders available in CPRS and let those requiring orders retrieve them directly & securely from CPRS. Reduce expenses in printing, save your staff/team time, and make the process of distributing stamped orders more secure than ever. Administrators – CPRS is your portal for all case information. Run CPRS reports to see your county cases and summary information on these cases. 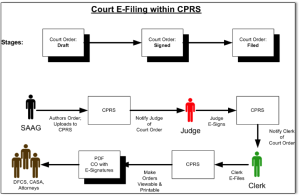 How do we get our Court Orders into CPRS? See detailed instructions to scan orders and upload into CPRS right here. Judges: None of my cases have the correct ‘Assigned Judge’. How do we get that fixed? Let the J4C team know & we’ll followup with DFCS. Sometimes, if you are a recent appointee in your county, DFCS may not have updated their judge list. We make sure updates to this LIST are sent to DFCS.